Last Wednesday, after the last leg of our Football Forward tournament, I took a nice drive over to the township of Mitchell's Plain to pick up several of the Academy boys for practice in Fish Hoek. It gave me a chance to drive along the coast, and get used to driving on the more busier roads here. An awesome rainbow (double rainbow actually) formed over the Fish Hoek fields as we started practicing, so check out the picture on the left! Earlier that day, when Treswill was having a private coaching session over at the Fish Hoek fields, a "normal-looking" man approached him while he was on the field, and asked him if the fields were going to be used the next day for games, and who to contact about using the field. So Treswill gave him the Chairman's number, and thought nothing of it. It turns out, on Thursday, several US military helicopters landed on the field in preparation for President Obama's visit on Sunday to the nearby black township of Masiphumelele (to visit the Desmond Tutu HIV/AIDS clinic there). While those helicopters were busy landing on our soccer field, I was busy driving to Somerset West to pick up the U13A team's new kit, which they used in a tournament that evening in Rygersdal. They won both games they played that night, as well as their game on Saturday, and advanced to the quarterfinal on Sunday. On Sunday, we went back to Rygersdal to play the quarterfinal, semifinal, and final. As we pulled in to the Fish Hoek Football Club to carpool to Rygersdal, we noticed three traffic cops standing by the roadway. Shortly after we had pulled into the parking lot, a police car pulled up with lights flashing. Moments later, an Incident Command Center bus pulled in, with another emergency vehicle. The police officer in the car told us that we needed to leave soon (which was fine with us because we were leaving soon anyways), because Obama was going to be coming in later. He also said that no one who lived near there would be allowed to leave their homes while Obama was in the area. In fact, a police officer would be stationed outside every single house in the neighborhood to prevent anyone from leaving their houses. Talk about a major disruption into the lives of the residents here! Anyways, we headed off to Rygersdal to play the quarterfinal against Vasco B. We won the quarterfinal with a score of 4-0. We advanced to the semifinals and won that with a score of 1-0. Between the semifinal and final, President Barack Obama flew over in Marine One (or Marine Two), along with four other helicopters on their way to Fish Hoek (and later on their way back). Excited with the dream of winning the Rygersdal Football Tournament Final now coming to fruition, the boys seized the chance to win the tournament final against Strandfontein. Two brilliant goals resulted in a 2-0 victory over Strandfontein. Ecstatically, the boys danced around and collected their trophies with joyful smiles. 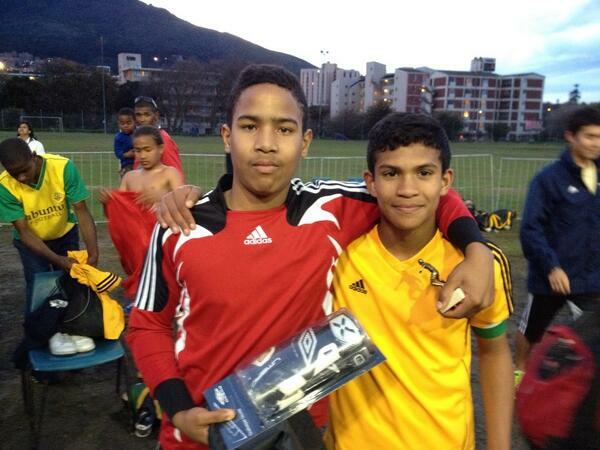 Taariq, our goalkeeper, won the U13 Goalkeeper of the 2013 Rygersdal Tournament (and was presented a free pair of new Umbro goalkeeper gloves). Jade, our captain, won the U13 Player Tournament award (and was presented R300). Overall, the boys had quite a blast and definitely enjoyed winning this tournament! This week, two American boys who played for Karl Ostrand, one of the coaches with Ubuntu, are flying in on Monday to spend three weeks working with us. On the 4th of July, we're hoping to get together with some more Americans, and have a nice little Independence Day party here in Ocean View. On Tuesday and Thursday, we're having a soccer skills camp to get an early eye on the young talent here in the Western Cape, before trials in August, so pray that it goes smoothly! While you're praying, please also pray for continued protection, and that I continue to stay focused on why I'm here. Also, there are soo many messed up things going on in this area, so just be praying in general for Ocean View, Masiphumelele, and the entire Western Cape!